Oktoberfest the world’s largest fair is held every year in Germany. It runs for 16 days from late September to the first weekend in October with more than 6 million people from around the world attending the event every year! If you can’t fly to Germany just grab an NRC Taxi who will drop you down to George’s Dock in the IFSC Docklands and you will get a real taste of Oktoberfest Irish style! There will be over thirty German speciality food producers and German traders, all travelling to Dublin for the Oktoberfest traditional German market. There is loads of entertainment and fun for all the family including the Bavarian Games where you need to display your Bavarian skills! Skills include Nailing, Schuhplattlern, Mass stemming, Dress up and show us your Bavarian outfit, Fliegerlied dance, Jodel contest, Show your muscles- who can carry the most steins! So you can learn to sing a yodel or dance a polka, as traditional Bavarian musicians, Die Alpen-show, will also play throughout the event. If you’re working in the area, drop down for traditional German food during your lunch break! There is a massive rage of delicious German food on offer including Bratwurst, Steak & Burger, Leberkäs, Haxn Sauerkraut, roasted potatoes, Hot Dog & Fries, Typical Burgundian ham, German Schmalzkuchen, Crepes, German candies, German Pretzels, and fresh Potato chips! If you’re not working nearby just call NRC Taxis and we will get you there! 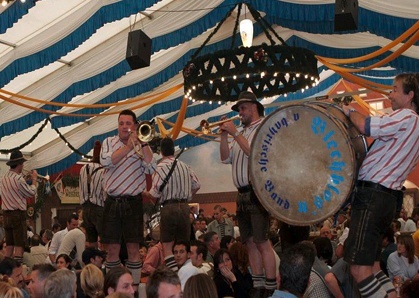 Of course we can’t discuss the Oktoberfest without mentioning the beer! Chilled and crisp German Erdinger “Fischer’s Hell” and “Weizenbier” (wheatbeer) will be on tap and for those not getting an NRC Taxi home there is non-alcoholic wheatbeer! For non-beer drinkers there is a German wine bar, longdrinks (havanna-coke, vodka-red bull) and lots more! There is also a great coffee-bar serving coffee, tea and hot chocolate! Getting there is easy as its bang in the city centre – just hail an NRC taxi and they will get you there in a jiffy! Call NRC on 6772222 or download our app visit www.nrc.ie for more.